In Adobe Captivate 5.5 you can now apply a gradient fill to drawing objects and the stage itself. This is a welcome addition as it allows you to create some more fancy graphics. This is something I have been using Adobe PhotoShop to accomplish for my projects (and I probably still will – see note later) but now I am able to do some of it directly in Adobe Captivate 5.5. The Gradient feature is accessed through the Fill & Stroke panel by clicking on the Fill color. 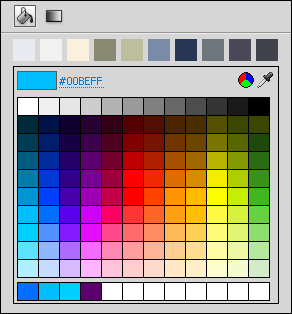 This opens up a familiar box where you can select which solid color you want to apply to your object. However, now you also have the symbol for Gradient up in the top. Clicking this will open up the Gradient box and allow you to specify a variety of things. At the top you have some predefined gradients you can use. You can change the direction of the gradient itself, change the colors of the gradient, change the type of gradient (linear or radial), reverse colors, change the pattern and save / delete custom gradients. Naturally you can also add more color points in the color band itself so you can create exactly the type of gradient that you like. This makes it really easy to apply a nice graphical touch to some of your assets in Adobe Captivate 5.5. 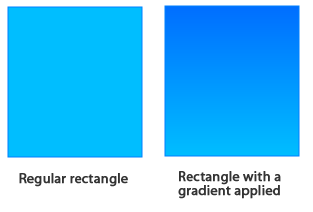 So – why will I still be using Adobe PhotoShop to create my gradients? Simply because I have more than 200 custom gradients and styles defined in PhotoShop already so for me it’s just a matter of selecting the layer in PhotoShop and then clicking a button. It’s really quick and easy for me to do. 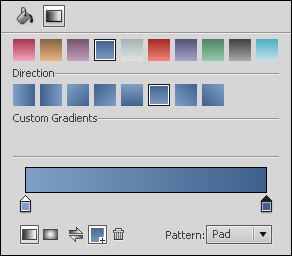 Adobe Captivate 5.5 allows you to save custom gradients as well, but it can only accommodate 10 custom gradients. That’s simply not enough for me and the time to recreate all these gradients from scratch in Captivate would also be an issue. For my quick and dirty gradient needs I do think I will use the new feature in Captivate 5.5 though as it does offer some advantages. Mainly because it’s easy but it’s also scaleable – If you create a rectangle in Captivate and apply a gradient then you can resize it directly on the stage and the gradient will also reapply itself. If you create a box in PhotoShop – apply a gradient – save it as a PNG and import it into Captivate then when you resize the box then the gradient will not behave in the same way and will get pixelated and ugly. Therefore you would need to resize the box in PhotoShop and then reimport it into Captivate.